Brides and grooms want to look their very best on their wedding day. They work out, watch what they eat, hire stylists and makeup artists. While your figure and attire may be exactly to your liking come the big day, the question is: Will you be satisfied about everything when you look back on the wedding pictures, or will you lament that you celebrated the occasion sporting seriously misaligned teeth? You can change your smile before you get married, and your orthodontics don’t have to get in the way of your wedding planning when you choose Invisalign braces. Are you thinking about what you’ll look like in your wedding photos? 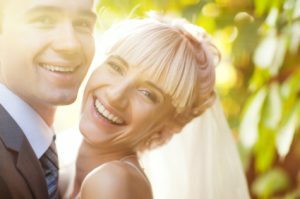 Are you envisioning greeting all your wedding guests and cringing at the thought of them focusing on your teeth instead of on you and your new spouse? If you are a stickler for the details, there is no doubt you’re considering how your smile will factor into the big day. Your smile is, after all, a constant and important accessory – on your wedding day and every day. Posing for pictures, both professional and candid, is an integral part of any wedding, which means your smile is too. The last thing you want to do is be ashamed of your teeth and hide your smile on your wedding day because of it. A tight-lipped or halfhearted smile will make you look like a reluctant bride or groom, when your real feelings are quite the opposite (we hope!). It’s easy to get caught up in the wedding planning process. You’re focused on everything being “just right” for the big day. You make time for visits with the florist or the pastry chef, the reception venue or the officiant. But it’s possible to make time for appointments with your Center City Invisalign provider too. In fact, you will make fewer visits to the dentist while undergoing Invisalign treatment than you would for any other type of orthodontia. With Invisalign, you are given a great deal of responsibility to stay on top of straightening your teeth on your own time – but that job will feel like a piece of cake when compared with planning a wedding. Wearing Invisalign will make you feel like you’re prepping thoroughly for the big day as you take control of your smile and see it changing for the better every day. Whether your wedding is in six weeks or several months or a year, Invisalign begins working immediately and will get your smile in better shape than it is right now so you will automatically get a confidence boost that will keep on getting bigger. Engagement photos: You’ll never see the aligners and, if your session is brief, you can remove Invisalign for the photo shoot if you like. Engagement party: No one will even notice that you’re wearing Invisalign so you can socialize with confidence. Eating: Even if you have a cake tasting or a menu tasting, you can easily remove Invisalign to dig in and enjoy the morsels. Dress/tux fittings: Just think how much better your reflection will look at the dressmaker’s or tailor’s when you sport a much-improved accessory with every visit – your smile. Some brides and grooms also experience an unexpected but welcome side effect of Invisalign – weight loss. Having to remove the aligners for meals and snacks will make you think twice about reaching for a sweet or soda, and that is a great perk for any wedding diet. Brides and grooms who are thoughtful about their wedding know they’re not just planning for the day, they’re planning for a future together. Your Invisalign treatment focuses on the present and future too. With straight teeth, you will not only look outstanding on your wedding day, you’ll have a gorgeous smile to last a lifetime. Your teeth will be easier to take care of, and therefore healthier. And you’ll find yourself blissfully smiling every time you look at one of your wedding photos and see the straight smile you’re proud of. You’ll be happy you made the time to become an Invisalign patient. Allow yourself the opportunity and the pleasure of smiling big for your entire wedding day and every day thereafter. Find out if you are a candidate for Invisalign braces by scheduling a consultation at Roberts & de Marsche, the orthodontic practice serving the Philadelphia and Lawrenceville areas. Our Center City dentists have treated over 2,000 Invisalign cases. It would be our honor and pleasure to give you that wedding smile you’ve always dreamed of having. When Should Your Child Be Evaluated for Youth Braces?